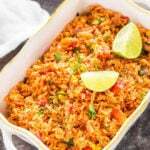 Instant Pot Mexican Rice – easy, quick, restaurant style Mexican Rice made in the Instant Pot. Serve it as a side dish or along with tacos, burritos, wraps! Mexican food is quite a favorite around here. In fact the first food that I warmed up to besides Indian was Mexican and it continues to be my favorite. While we get really good Mexican food here, I really had the best one in Mexico itself. You clearly get the best food at it’s place of origin. Isn’t it? I remember we went on to this trip to Chichen Itza from Cancun and in between somewhere we ate tacos with veggies and those were the best soft tortillas I have ever eaten! So good! I didn’t even need anything fancy topping, it was that good. I wish I could make tortillas like that at home, well maybe someday. For now, let’s talk about Mexican Rice! 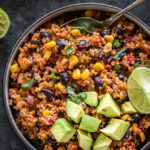 So my most pinned recipe and one of my most popular posts on the blog is this – Vegetarian Mexican Rice. It’s a super simple recipe but people really like it. Because you guys love it so much, I thought I should share an instant pot version of the same too. I tried to make it even more simpler. 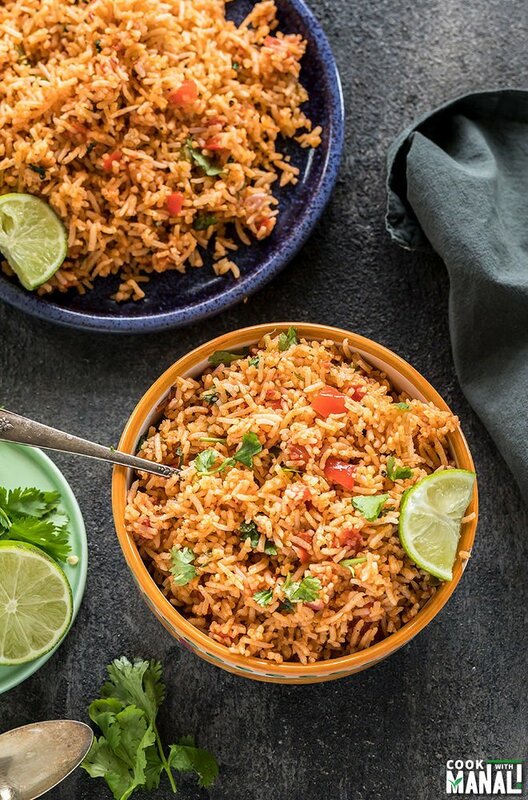 Less ingredients, less prep work and restaurant style Mexican Rice all made in the IP! 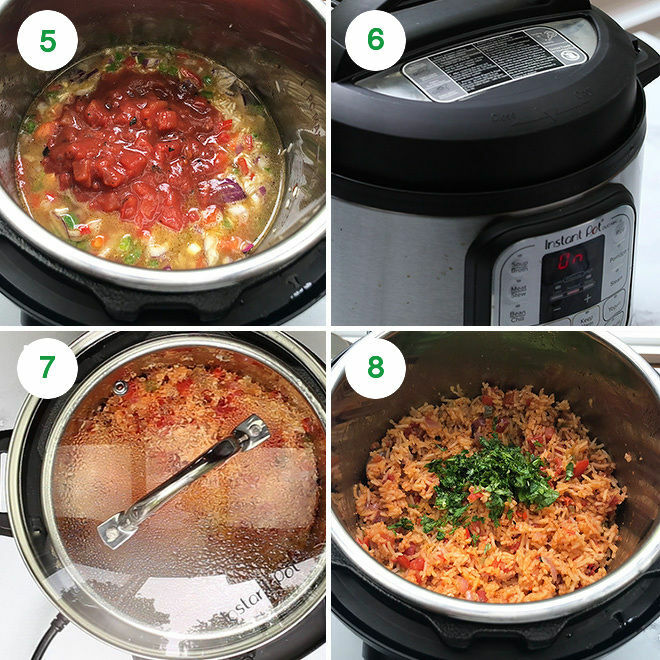 The recipe for this Instant Pot Mexican Rice is really simple but it took me several tries to get it right. When you use thick canned tomatoes in your IP, the sauce can get stuck at the bottom. The pot doesn’t come to pressure and you get the burn message. Fir my first trial, I did everything as usual and stirred the tomato along with everything. The pot did not come to pressure. I did not get the burn message and the rice got cooked too (because it was covered for so long) but I obviously couldn’t share the recipe with you. So for the next trial, I again did everything as usual but this time around added the tomatoes at the very end didn’t stir it. And that was it, perfect Mexican Rice in the Instant Pot! The key is not stir the tomatoes especially when there isn’t enough liquid to begin with. 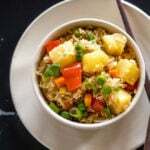 I have used basmati rice in this recipe. I know it is not the traditional rice to make Mexican Rice but that’s what I had at home and it worked out quite well for the recipe. If you change the rice, the water quantity might change too. So stick to basmati recipe for this recipe. 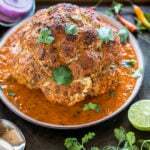 This recipe is relatively simple with garlic, onions, jalapeño, pepper and cilantro. You can even add corn here. A squeeze of lime juice at the end would be nice too! The recipe is easily customizable. 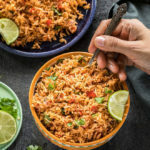 I make a big batch of this instant pot Mexican rice for summer parties and get togethers. First of all I don’t need to turn off my stove in this heat so that’s a huge plus! And second, this rice can be pretty much used as a side or a main along with tacos/burritos. I love the versatility and ease of this dish! Rinse the rice until water turns clear. Then drain the water and let the rice dry. 1- Press the saute button on your Instant Pot. Once it displays hot, add oil to the pot. Then add the rice and cook for 4-5 minutes until toasty. 2- Add the bell pepper, jalapeno, onion, garlic and saute for 1 minute. 3- Add the cumin, salt and saute for 30 seconds. 4- Now add the water and stir to deglaze the pot (there shouldn’t be anything sticking to the bottom). 5- Add the canned crushed tomatoes on top. Do NOT STIR. 6- Close the pot with its lid. Press the manual or pressure cook button and cook on high pressure for 5 minutes. The pressure valve should be in the sealing position. 7- Let the pressure release naturally for 2 minutes and then do a quick pressure release. Open the pot, now carefully stir the tomato with the rice using a spoon. Cover pot with a glass lid, let it remain like that for 2 minutes. 8- Remove the lid and add the cilantro. Fluff the rice with a fork. You may squeeze in some fresh lime juice. Serve Mexican Rice as a side or with beans or inside tacos, burritos! Enjoy! 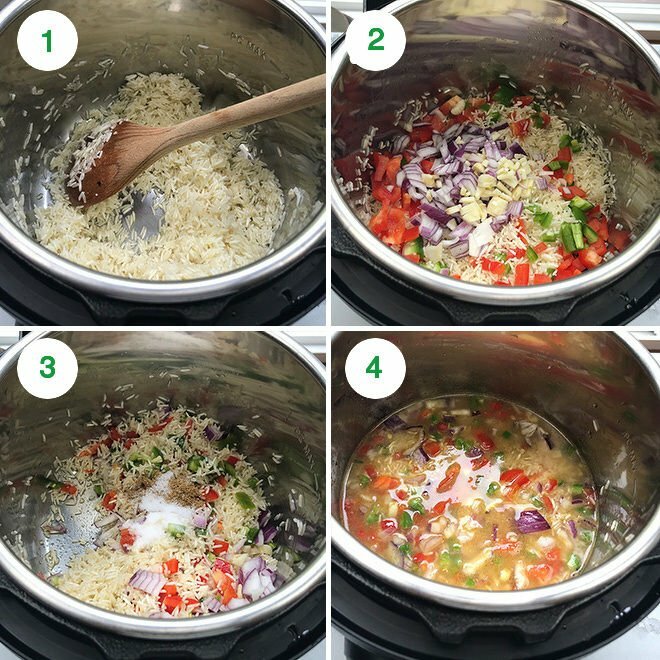 If you’ve tried this Instant Pot Mexican Rice Recipe then don’t forget to rate the recipe! You can also follow me on Facebook, Instagram, Pinterest and Twitter to see what’s latest in my kitchen! 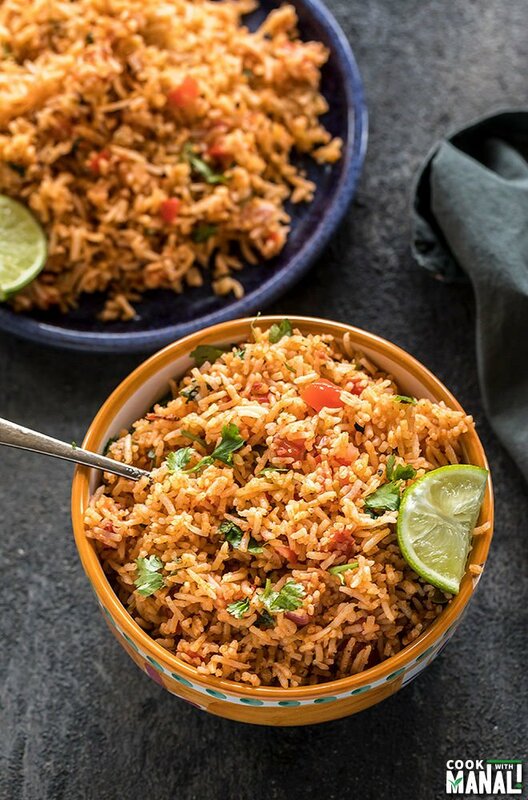 Restaurant style Mexican Rice made in the Instant Pot! This pot meal makes a great side and also be served with tacos, beans, burritos! Vegan and gluten-free. Press the saute button on your Instant Pot. Once it displays hot, add oil to the pot. Then add the rice and cook for 4 to 5 minutes until toasty. Add the bell pepper, jalapeno, onion, garlic and saute for 1 minute. Add the cumin, salt and saute for 30 seconds. Now add the water and stir to deglaze the pot (there shouldn't be anything sticking to the bottom). Add the canned crushed tomatoes on top. Do NOT STIR. Close the pot with its lid. Press the manual or pressure cook button and cook on high pressure for 5 minutes. The pressure valve should be in the sealing position. Let the pressure release naturally for 2 minutes and then do a quick pressure release. Open the pot, now carefully stir the tomato with the rice using a spoon. Cover pot with a glass lid, let it remain like that for 2 minutes. Remove the lid and add the cilantro. Fluff the rice with a fork. You may squeeze in some fresh lime juice. 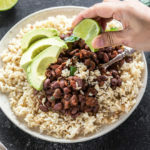 Serve Mexican Rice as a side or with beans or inside tacos, burritos! IP method seems even easier and the result is just as amazing! I didn’t see how much tomato sauce to add so I did an 8 ounce can. It came out great. its 1 cup of crushed canned tomatoes..glad you like it! You say to add tomato sauce and cover with glass lid and let sit for 2 minutes. You say to add the crushed tomatoes prior to this so lm confused! Hi Julie, i mean the same thing. 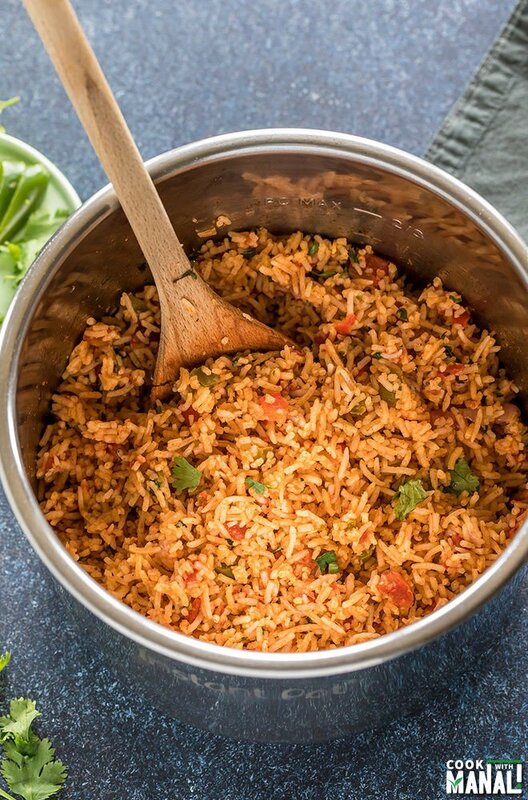 We add crushed tomatoes on top of rice and do not stir and pressure cook. Once rice is cooked, I then stir the tomatoes with rice and cover with lid and let it sit for 2 minutes. Let me remove the word “sauce” so that there’s no confusion. This recipe is exactly what I’ve been looking for. 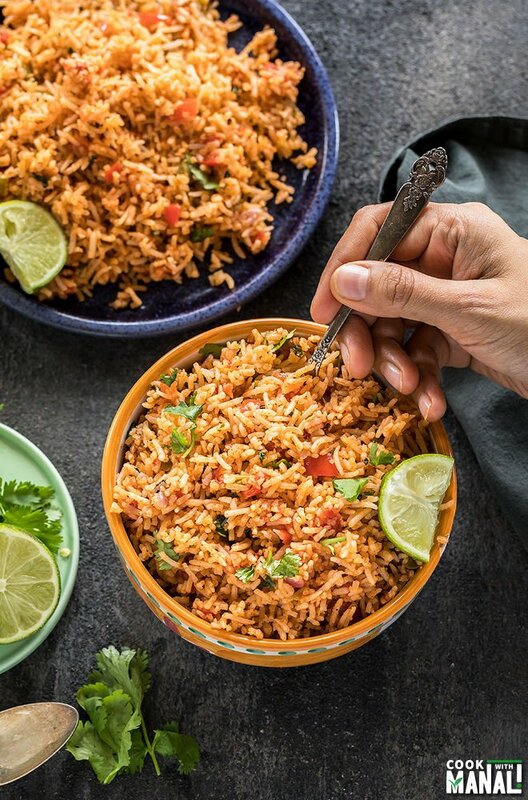 Just a couple of questions, have you made it with brown basmati rice and have you ever doubled or tripled the recipe? If yes, do I need to increase the cooking time? I’m having 30+ people over and serving pulled pork burrito bowls. Any tips appreciated. Thanks! I have not tried this recipe with brown basmati rice..the cooking time will change significantly if you do that. I have also never doubled or tripled this recipe but I am sure you could. The cooking time should remain same. If I want to double this recipe, do I change cook the time? 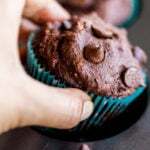 Thanks for the recipe–it looks great! If I want to double the rice, do you think I should double everything else (but not the cooking time)? Also, did you drain your crushed canned tomatoes first? I did not drain my crushed canned tomatoes. & I would probably double everything except the cooking time…hope that helps! I don’t know why, but when I made this, I got a burn message! I had to remove the lid and although everything was cooked, it had a slightly mushy texture and the outcome was a bit bland. What do you think went wrong? hmm did you follow the instructions exactly and did not stir after adding the tomatoes? I don’t see any reason why you should get burn message if there’s nothing thick at the bottom. And if you think it was bland, add more jalapeno, more cumin! Is it possible to replace the basmati rice with brown rice? One less thing to buy at the grocery store would be awesome. 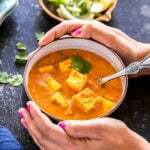 Manali, Thank you so much for this recipe. I do think it needs more salt as it is a little bland…maybe a tablespoon? tablespoon salt would be too much, trying adding 1/2 teaspoon! Can you use regular white instant rice? This was absolutely delicious! My whole family loved it. Thank you thank you thank you thank you for introducing me to this recipe!!!!!! When I commented the other day on the Thai Peanut Noodles I hadn’t had a chance yet to taste the rice because I was super busy on my one day off but I had some last night and WOW!!! I will never use that stuff in a bag at the store ever again!!!! I shared some with a buddy at work who’s been eating my cooking for a few years now and we’ll see how he likes it! For the rest of my life this will be the recipe I will use any time I want Mexican Rice!!! Love your videos and channel and website!!!! I am not a vegetarian but do like veggies! Thanks again very much!!!! 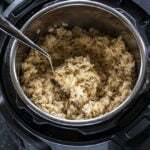 I will definitely recommend this and others to people on the Instant Pot Community or anywhere else if someone asks for a recipe for this or other items!!!! Just an FYI! My buddy at work loved it as much as I did and asked me to thank you from him! Do you think this would work with riced cauliflower? really? 5 minutes is plenty for basmati or long grain white rice… IP does take time to come to pressure so one has to keep that time in mind too..I am very surprised that white rice didn’t cook in 5 minutes..I cook it all the time this way..glad you liked the flavor! LOVED this meal! It really hit the spot for me, thank you so much!